If you have been reading my Blog at all you know that I am partial to Art Galleries. I especially love the art galleries throughout Europe. I can spend hours and hours walking through them. Earlier in my life, I had many years of art training from painting to sculpting, however I never had the talent needed to succeed. I suppose I have never lost that desire to be an Artist, although I am sure I would be a starving artist today if I had followed that path. In Barcelona, there is no shortage of exciting art galleries to sample. It can be safely said that local galleries will appeal even to those who would not normally consider themselves art lovers. The Picasso Museum is the city’s most popular art gallery, with more than a million people visiting it annually. 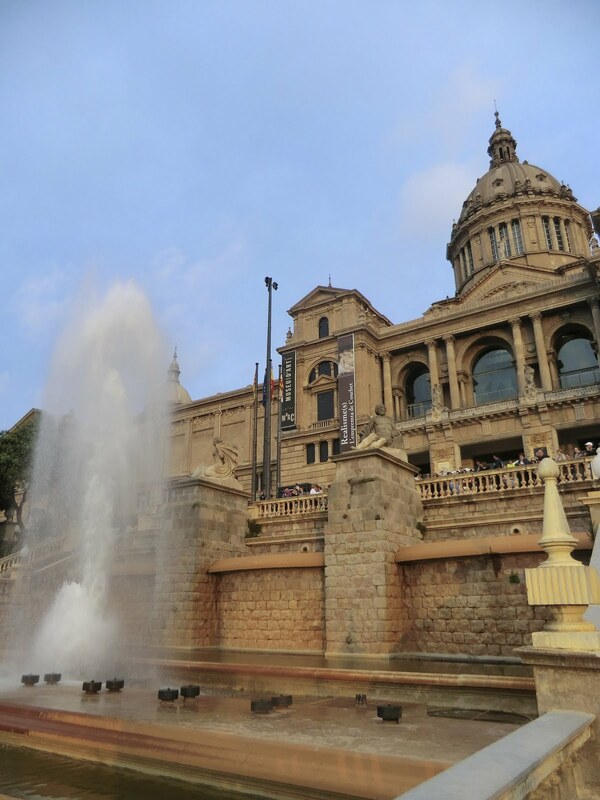 With over 55 museums in Barcelona covering a plethora of subjects including art, history, architecture, science, sports, war and maritime, there is something for everyone. 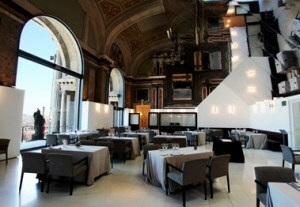 I have included a number of the other most popular museums in and around Barcelona. 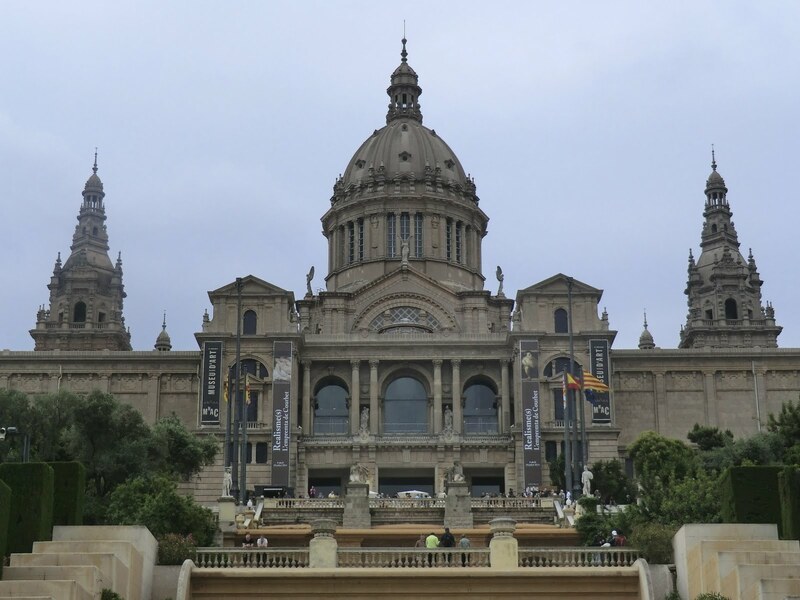 However today I wanted to share with you just one of them, The Museu Nacional D’Art de Catalunya. 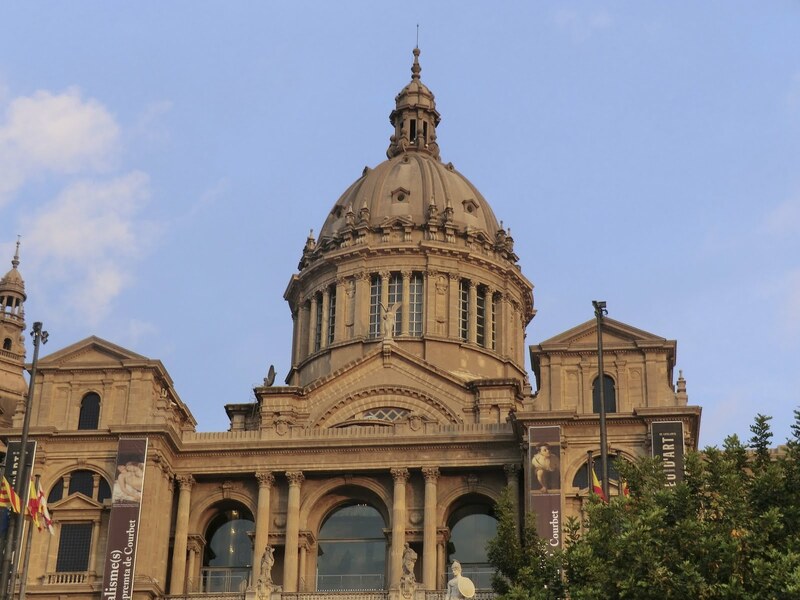 The MNAC (Museu National D’Art de Catalunya) embraces all the arts (sculpture, painting, objets d’art, drawing, engraving, posters, photography and coinage) and has the task of explaining the general history of Catalan art from the Romanesque period to the mid-twentieth century. 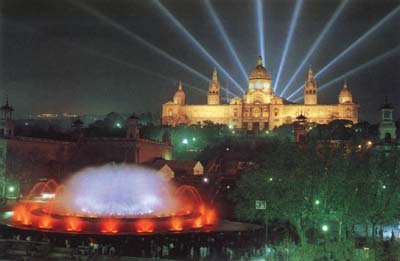 Located at the base of Montjuic, within the domed Palau Nacional, which was built for the 1929 World’s Fair. The Museum was located in this building in 1990 in preparation for the 1992 Summer Olympic’s. 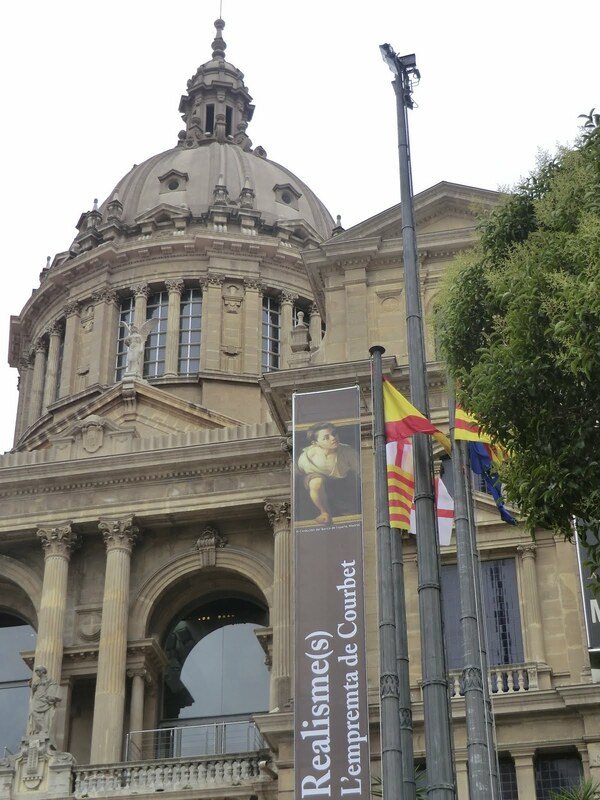 The Catalonian Museum Law reunited the collections of the former Museu d’Art de Catalunya (Catalonian Art Museum) and the Museu d’Art Modern (Modern Art Museum), and declared it the national museum. This museum is anything but a stale repository of art, it holds some of the worlds most impressive pieces of Religious Art. 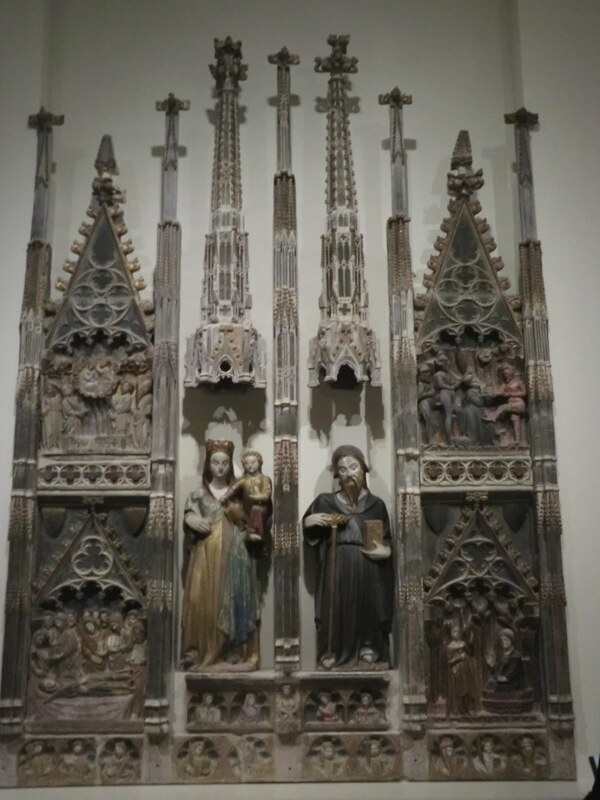 It’s medieval collection, which includes Romanesque works salvaged from churches all over Calalunya, is unequaled; many of the superb altarpieces, polychromatic icons and treasured frescoes are displayed in apses, just as they were in the country churches where they were found. 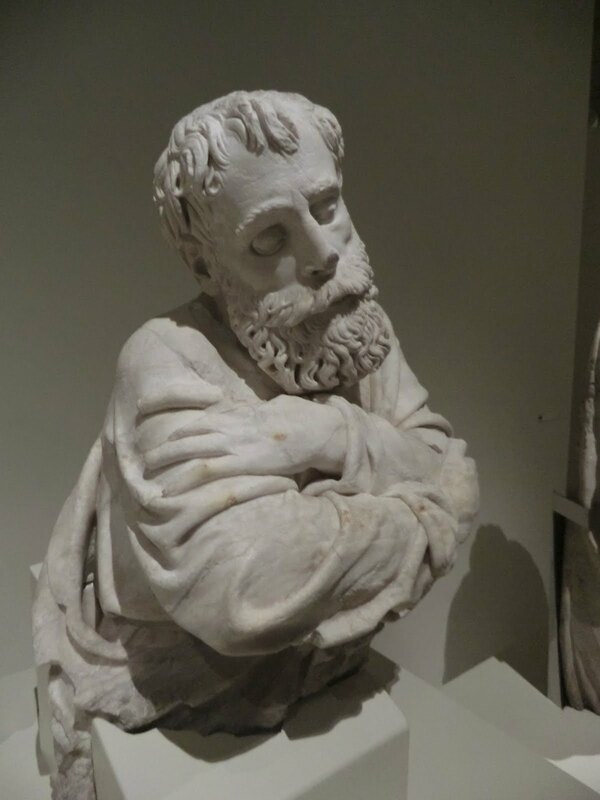 Other highlights are paintings by some of Spain’s most celebrated Old Masters including Velazquez, Ribera, El Greco, Cranach, Rubens and Zurbaran as well as nine newly acquired Picasso’s, exhibited in their own gallery (where camera’s are not allowed of course). 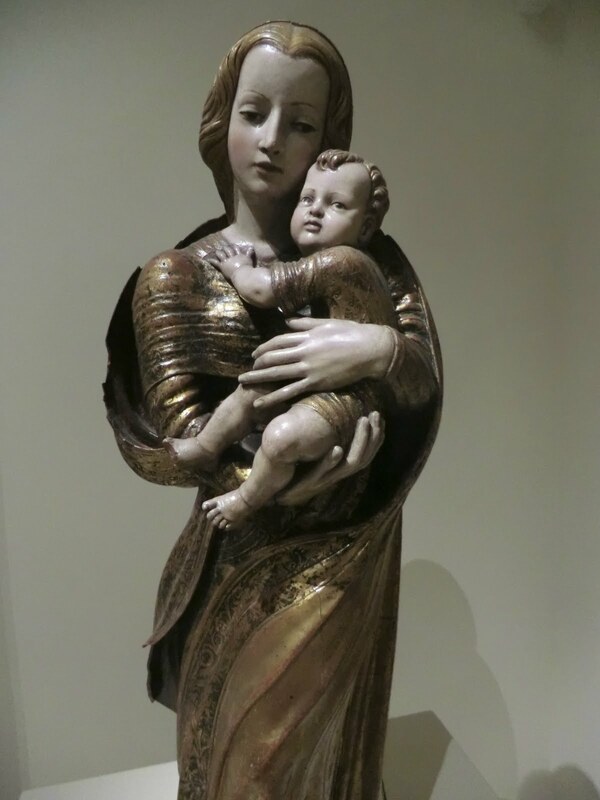 The Museum oversees the restoration of monuments and directs operations in painting, sculpture and other artistic techniques, and gives advice to other museum centers on questions referring to safety, museography and preventive conservation. The National Palau of Montjuïc was constructed between 1926 and 1929, with the goal to be the main building of the International Exhibition of Barcelona of 1929, for an Exhibition of Spanish Art (The Arte in España), with more than 5.000 works coming from throughout Spain. It shows a symmetrical main façade, with a central body which stands out and two lateral ones; the central body is crowned by a dome of roman, dominant style and connects itself to the sides of two smaller domes. The Palau has an area of 32,000 m² and is from classicist style, inspired in the Spanish Renaissance. The waterfalls and fountains of the outside staircase of the Palau would be a work of Carles Buïgas. In the same period nine big projectors that today still issue some intense bundles of light that write the name of the city in the sky were placed. In the opening ceremony of the exhibition The Arte was made in España, presided by the king Alphonse XIII and the queen Victòria Eugènia. In the year 1985 the first projects started to be discussed for rehabilitating the building, but it was not until 1990 that the works of restitution started according to the project of the architects Gae Aulenti and Enric Steegmann. The year 1992 the rehabilitation of the Oval Room and the consolidation and partial structural of the building was carried out, as well as the restructuring of two galleries. The thing you notice when you begin your stroll up Montjuic Hill is the Fountains that line the street and climb the hill. The locals call these the Magic Fountains. At night the Palacio Nacional, which is high up the hill casts nine beams of light to the sky. The same number of letters in the word Barcelona, which combines with the forms and colors of the magic fountains below (a little Disney-esque I think). It is one of the most beautiful displays of fountains I have ever seen. Thousands of spectators come to watch the fountains every night. On our trip, around 9 p.m. 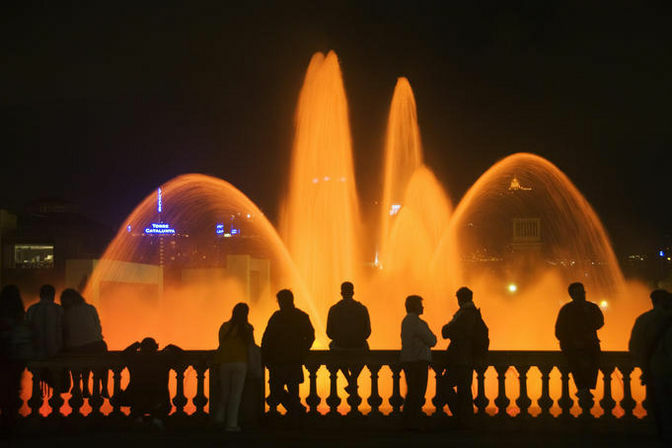 The fountains began their famous light, water and music show which continued until 11 p.m.
We had the luxury of watching from O’leum the Museu National D’Art de Catalunya’s Restaurant. 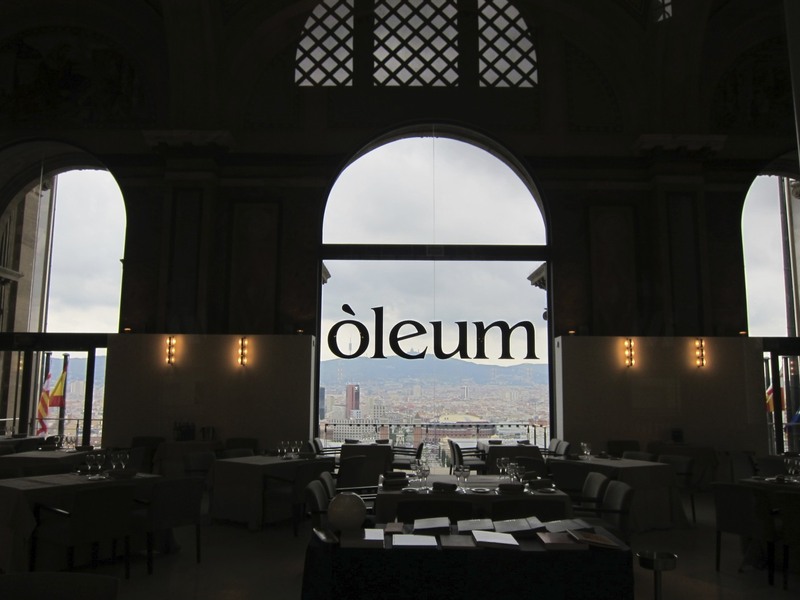 If you have the opportunity to enjoy the museum, think about reserving dinner around 8 p.m. At Òleum. Opened in May 2005, it serves an up-to-date Mediterranean cuisine based on the use of top-quality products. It is located in the Palau Nacional’s former Throne Room, where King Alfonso XIII inaugurated the 1929 International Exhibition. With room for 100 people, the Òleum covers 2,475 square feet and has a superb view of Barcelona which can be enjoyed from the large windows and seen reflected and repeated in the ceiling mirrors. 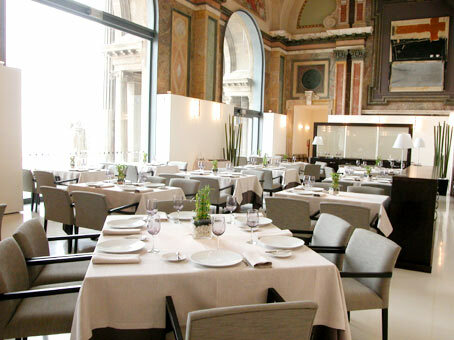 The restaurant preserves its original decoration, which has been modernized and complemented with comfortable, modern furniture and fittings made from exotic materials such as wengé. With its individually controlled lighting, the Òleum manages to create a cosy atmosphere in a sober and at the same time elegant setting. At night, it makes a unique venue in which to watch the Magic Fountains below. Just make sure you reserve a window table, you won’t be disappointed. Museu National D’Art de Catalunya, a set on Flickr. 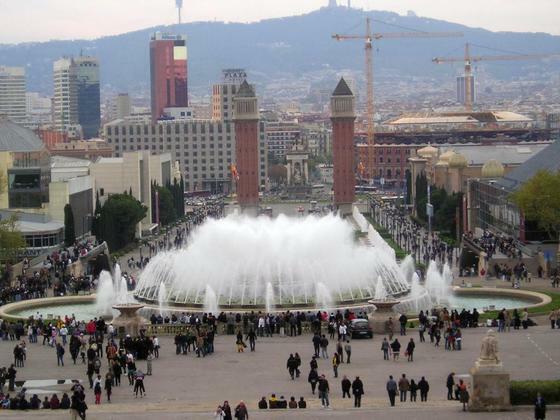 ← Barcelona’s most famous building, 129 years and still not done. Thank you for the post and the lovely photos. Thank you for stopping by my Blog, it’s greatly appreciated.